DEARBORN, Mich., Jul. 16, 2018 – When Teri Lou Dantzler returned home from her New Zealand vacation in 2016, one of the first items on her to-do list was researching vans. That’s because Dantzler, a landscape photographer and grandmother, had just spent her holiday camping in a large vehicle, or “camper-vanning,” as it’s known in some parts – and loved it. After deciding to purchase a Ford Transit, she spent the next four months working with her father to outfit the vehicle with everything she needed to accommodate long road trips to capture the best photos around the U.S. – a bed, workspace, refrigerator, freshwater system and plenty of storage – and documented the whole thing on YouTube. Living in vans – once upon a time a lifestyle dedicated mostly to surfer dudes – is now expanding to include women like Dantzler. In fact, more and more women are tricking out vans and taking their lives on the road, choosing Ford Transit and Transit Connect as platforms on which to build their own homes. 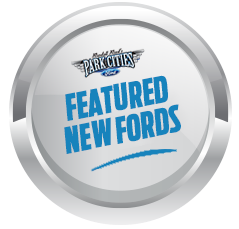 Women buying Ford vans cite their lower costs, reliability, safety and security, and serviceability through Ford’s extensive North American dealer network as key purchase considerations. For Rebecca Gross, a former Air Force captain and champion cyclist, it’s easy to be productive out on the road. Eight months out of the year, Gross depends on her 2017 Transit cargo van to get her to cyclocross and mountain biking events. She says the freedom is incredible. It took just a matter of days and a few hundred dollars in materials for Gross and a friend to outfit the Transit for her home on the road. She built a platform bed with storage underneath, a counter and another storage system for cycling gear and personal items. “On a cyclist’s budget, the Transit is a lot more affordable option,” says Gross. “The dealer was surprised to hear what I was planning to do with it, but personalizing the van just the way I wanted was really fun.” She estimates the cost was $10,000 less than competing vans. 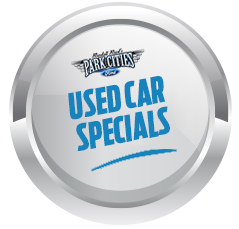 Equally important to Dantzler and Gross is the extensive Ford dealer network across North America. With more than 3,200 Ford and Lincoln dealers and more than 675 commercial vehicle centers in the United States, Ford Transit owners enjoy significantly greater access to service and maintenance compared to Mercedes-Benz Sprinter owners. Surfer and graphic designer Tasha Rivard lives in a 2010 Transit Connect in Carbondale, Colorado. Like Dantzler, she spent much of her free time studying abroad in Australia traveling the Outback in a rented van. After, she moved to Hawaii, where she met friends living in their vans. When she “stumbled across a Transit Connect at a Ford dealership” two years ago in Texas, Rivard began planning her own home on the road. 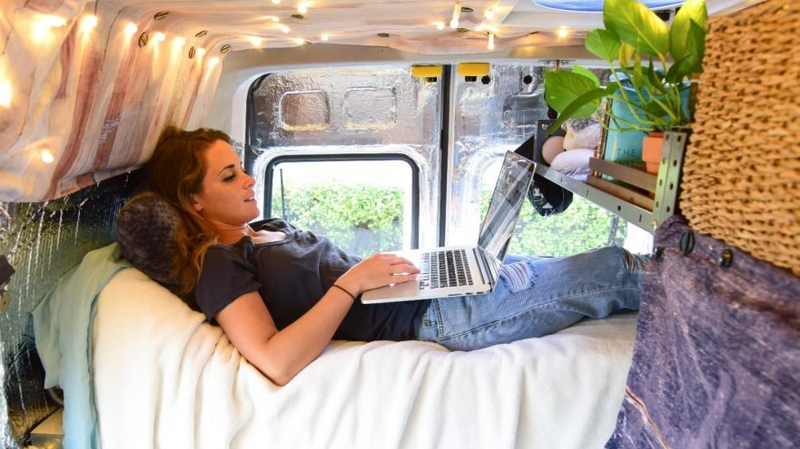 Rivard’s Transit Connect includes a compact bed that rolls up to expose a workspace with a desk for her freelance design, and art and jewelry projects. A 100-watt solar panel charges a house battery that powers her refrigerator, lights and other electronic devices. Like many who call their vans home, Rivard keeps up a gym membership where she can exercise and get a shower. She also has a portable electric shower hooked up to a freshwater tank in the van where she can rinse off after a morning surf. Van life is very community-oriented, and once you get into it, you quickly realize how many other people are doing it too, says Rivard, who credits social media with helping her create connections with like-minded individuals. Safety has never been an issue either. “You get used to picking the right spots, and you just rely on common sense,” she says. Certain modifications and equipment installation may void manufacturer warranty. Consult your Ford dealer before installing any aftermarket equipment.